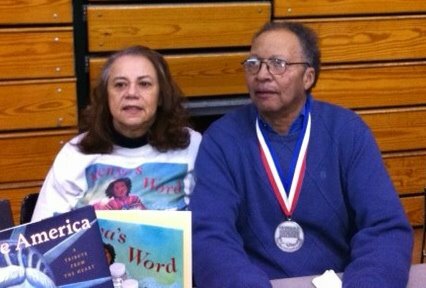 Linda Trice and Walter Dean Myers at the annual African American Children’s Book Fair in Philadelphia. Tributes have been posted mourning the passing of Walter Dean Myers’s unexpected death on July 1, 2014. Many heartfelt ones are from readers who believed that Walter’s work spoke directly to them, reflected their life, understood their pain and guided them towards a hopeful future. People ask what they can do in remembrance of him. Knowing Walter and having read his books, or heard him speak many know the answer–inspire kids to read. We must remind young people and the adults who guide them of the importance of reading. “As a young man, I saw families prosper without reading, because there were always sufficient opportunities for willing workers who could follow simple instructions. This is no longer the case. Children who don’t read are, in the main, destined for lesser lives. I feel a deep sense of responsibility to change this.” Publishers Weekly wrote that Walter believed that reading saved his life. Walter was raised by two good Harlem people, Florence and Herbert Dean. Walter gave them copies of his books and sadly learned that his beloved dad hadn’t read them. He later discovered why. His father, like many Black men of his generation had never learned how to read. Walter visited men and children in prisons while doing research for his award winning novel MONSTER. He realized that a huge percentage of them couldn’t read past an elementary school level. Some of them could barely read at all. He wondered how they could get a job when they were released. This knowledge resulted in prison literacy becoming one of his passions. Seeing the limitations of his father and those of kids in prisons helped shape Walter’s belief that the ability to read gives us power. We should praise Walter and enjoy his books. Hopefully though many of us will reflect on Walter’s message and tell others: “Reading is not an option.” It is how we get power and a better future because in life reading is truly not optional. Linda Trice is the author of Kenya’s Song (Charlesbridge Publishing). Visit her at www.LindaTrice.com.